Nitrate Filter Treatment Systems for city or Well Water. Do you need to remove nitrates from your water? No matter whether you just need a small inexpensive nitrate water filter for your drinking water, or whether you want a big backwashing nitrate removal filter for the whole house or building. There is no need to worry. 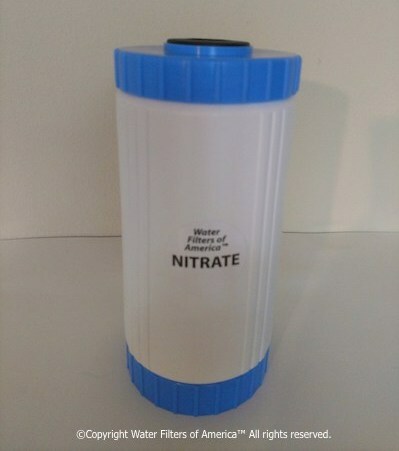 Our nitrate water filters are easy and inexpensive to buy and use. We have every kind of nitrate filter system you could possibly need. You will see the most popular versions we sell on this page. And we have friendly water techs who can help you figure it out if you need help. No pressure, no hassle. We can actually build the perfect nitrate water filter system for you at no extra charge. It will be made for exactly the kind of water you have. 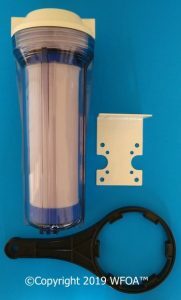 This 10" nitrate cartridge filter can be used as a stand alone filter for just your drinking water. It is an industry standard size of 10" x 2.75", and fits most standard sized filter housings. Or it can be placed inside a reverse osmosis drinking water system that uses common industry standard sized filters. Now you can have nitrate free water at a price you can afford. Nitrate is tasteless and odorless, therefore the water needs to be analyzed to detect contamination. Also, nitrate is very easily dissolved in water, which makes it difficult to remove (Until Now). Drinking water high in nitrates is harmful to humans and animals, especially infants and the elderly. Nitrate contamination can occur in well water due to improper construction or location, overuse of fertilizers or improper disposal of human and animal waste. If you have any questions regarding our nitrate filters, email us or call us anytime! 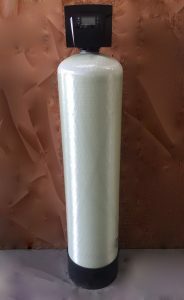 This inexpensive 10 inch nitrate filter cartridge can be used by itself to filter nitrates from drinking water. It is the industry standard size of 10" x 2.75". We also have most other standard sizes. Just call and speak with a friendly water tech for assistance with the many choices. We can make you anything you want. We have larger canisters for the whole house. And we have large tanks that backwash for whole house nitrate systems as well. Reverse osmosis is the most popular way to remove nitrates from well or city water. We have many reverse osmosis options for nitrate removal. Not to mention the many other contaminants it removes. Including lead, bacteria, chemicals, salt, sodium, dirt, contaminants, bad taste and odors, just to name a few. If you want to remove moderate to high levels of nitrates from just your drinking water, we would recommend that you use the 5 stage reverse osmosis system with a nitrate cartridge added. Read about Reverse Osmosis for information about drinking water filters that remove nitrates from your water. Many to choose from. Our nitrate filters come equipped with a state of the art control valve and are made of the highest quality components on the market. No need for backup batteries and other silliness with our High-Tech nitrate filters. They are hard programmed at the factory so the setting will always be correct. Even if there is no power to the unit for 6 months! They are great for seasonal homes and cabins too. Also note: For higher flow rates, we recommend the Hi Flo models. Nitrate is tasteless and odorless, therefore the water needs to be analyzed to detect contamination. Also, nitrate is very easily dissolved in water, which makes it difficult to remove. Drinking water high in nitrates is harmful to humans and animals, especially infants and the elderly. Nitrate contamination can occur in well water due to improper construction or location, overuse of fertilizers or improper disposal of human and animal waste. If you have any questions regarding our nitrate filters, email us or call us anytime! You can also order the quick connect option during check out, for easy DYI installations. Or you can call and have a friendly water tech give you hassle free help. Give us a quick call at 800-684-0979.